Agaricus is a genus of mushrooms containing both edible and poisonous species, with possibly over 300 members worldwide. 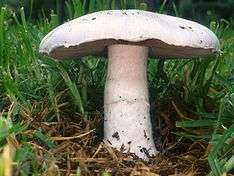 The genus includes the common ("button") mushroom (Agaricus bisporus) and the field mushroom (Agaricus campestris), the dominant cultivated mushrooms of the West. Members of Agaricus are characterized by having a fleshy cap or pileus, from the underside of which grow a number of radiating plates or gills on which are produced the naked spores. They are distinguished from other members of their family, Agaricaceae, by their chocolate-brown spores. Members of Agaricus also have a stem or stipe, which elevates it above the object on which the mushroom grows, or substrate, and a partial veil, which protects the developing gills and later forms a ring or annulus on the stalk. For many years, members of the genus Agaricus were given the generic name Psalliota, and this can still be seen in older books on mushrooms. All proposals to conserve Agaricus against Psalliota or vice versa have so far been considered superfluous. Donk reports Linnaeus' name is devalidated (so the proper author citation apparently is "L. per Fr., 1821") because Agaricus was not linked to Tournefort's name. Linnaeus places both Agaricus Dill. and Amanita Dill. in synonymy, but truly a replacement for Amanita Dill., which would require A. quercinus, not A. campestris be the type. This question is compounded because Fries himself used Agaricus roughly in Linnaeus' sense (which leads to issues with Amanita), and A. campestris was eventually excluded from Agaricus by Karsten and was apparently in Lepiota at the time Donk wrote this, commenting that a type conservation might become necessary. The alternate name for the genus, Psalliota, derived from the Greek psalion/ψάλιον, "ring", was first published by Fries (1821) as trib. Psalliota. The type is Agaricus campestris (widely accepted, except by Earle, who proposed A. cretaceus). Paul Kummer (not Quélet, who merely excluded Stropharia) was the first to elevate the tribe to a genus. Psalliota was the tribe containing the type of Agaricus, so when separated, it should have caused the rest of the genus to be renamed, but this is not what happened. The use of phylogenetic analysis to determine evolutionary relationships amongst Agaricus species has increased the understanding of this taxonomically difficult genus, although much work remains to be done to fully delineate infrageneric relationships. Prior to these analyses, the genus Agaricus, as circumscribed by Rolf Singer, was divided into 42 species grouped into five sections based on reactions of mushroom tissue to air or various chemical reagents, as well as subtle differences in mushroom morphology. Restriction fragment length polymorphism analysis demonstrated this classification scheme needed revision. Section Arvense Konrad & Maubl. Contains 19 species in six subgroups similar to the horse mushroom, A. arvensis, it has versatile heterothallic life cycles. Outlined by Singer in 1948, this section includes species with various characteristics similar to the type species A. xanthodermus. The section forms a single clade based on analysis of ITS1+2. Based on DNA analysis of ITS1, ITS2, and 5.8S sequences, this section (also known as section Hortenses) may be divided into six distinct clades, five of which correspond to well-known species from the temperate Northern Hemisphere: A. bisporus, A. subfloccosus, A. bitorquis, A. vaporarius and A. cupressicola. The sixth clade comprises the species complex A. devoniensis. The genus contains the most widely consumed and best-known mushroom today, A. bisporus, with A. campestris also being well known. The most notable inedible species is the yellow-staining mushroom, A. xanthodermus. All three are found worldwide. One species reported from Africa, A. aurantioviolaceus, is reportedly deadly poisonous. ↑ Wakesfield E. (1940). "Nomina genérica conservando. Contributions from the Nomenclature Committee of the British Mycological Society, III". Transactions of the British Mycological Society. 24 (3–4): 282–293. doi:10.1016/s0007-1536(40)80028-4. ↑ Letter is script and looks like a Russian и. ↑ Donk, M.A. (1962). "The generic names proposed for Agaricaceae". Beiheifte zur Nova Hedwigia. 5: 1–320. ISSN 0078-2238. ↑ Singer, Rolf (1987). Agaricales in Modern Taxonomy. Lubrecht & Cramer Ltd. ISBN 3-7682-0143-0. ↑ Singer R (1948). "Diagnoses Fungorum Novorum Agaricalium". Sydowia. 2: 26–42. Wikimedia Commons has media related to Agaricus.
" Multilingual taxonomic information". University of Melbourne.